Earlier this month, Network for Good held our annual Kick-Off Summit near our offices in Washington, D.C. Our mission for the day—bring the full organization together to start the year as a unified front. The day began with a rousing keynote address from Robert Egger, founder of D.C. Central Kitchen, Campus Kitchen Project, and L.A. Kitchen; which have collectively produced over 45 million meals and helped over 2,000 individuals obtain jobs. By the time Robert was done speaking, we were all fired up to make the world a better place—one nonprofit at a time. But the inspiration didn’t stop there. Another highlight of the day was a customer panel discussion featuring representatives from three of the local nonprofit organizations we serve—Colin A. Berry, M.S. 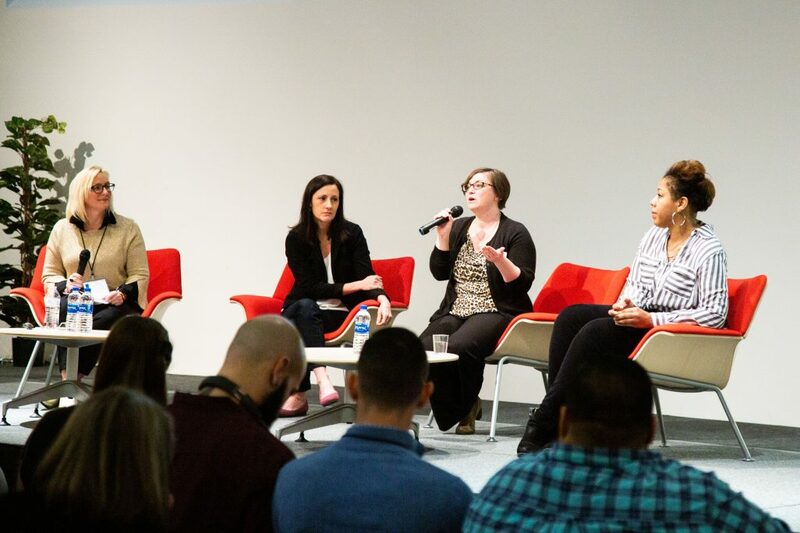 (Development Director, Humane Society of Washington County), Jayme Dingler (Marketing and Development Director, Talbot Interfaith Shelter), and Latoya Lewis (Founder and Executive Director, EnventU)—and moderated by Kimberly O’Donnell, Network for Good’s Lead Fundraising Coach. The conversation focused on how these three nonprofits are actively creating a memorable donor experience; including thank yous, events, #GivingTuesday, and donor management. Below is an excerpt about their journey and the thought process that led them to Network for Good. Kimberly O’Donnell: What were you looking for when you were evaluating donor management software, and what attracted you to Network for Good? What factors into your decision-making process? Colin A. Berry: We switched in October after looking at about 10 different companies. We were moving from a very large software company, that we found extremely frustrating. There were three things that really convinced us to choose Network for Good. One, it’s an attractive system, and if we have to work in a program and look at it for several hours a day, it helps that it is visually appealing and that the information is clear. Second, everything was included. There were no crazy fees to talk to support. In our past system, we were charged to ask questions by phone, so we weren’t able to run special campaigns and do what we needed or wanted to do with fundraising. And, finally, we came in with more than 20,000 records in our database, but I knew they weren’t all active contacts. I didn’t want to pay to store data on people who hadn’t recently supported us. With Network for Good, we were able to start at one level, and as we cleaned our files and our actual number of active donors became clear, our contract was adjusted. We got our data down to just under 7,000 records. Now we’re only paying to store data on individuals who are actively engaged with our mission. Jayme Dingler: The biggest thing we were looking for when we were switching donor management systems was the ability to create multiple donation pages. Everything is so easy and user-friendly in the system. You can do so many different things with it, from entering a new contact to entering donations to segmenting donors. You can create custom fields and segment donors simply by checking a box. I see the results of the feedback that I give in the updates to the product. That’s so commendable. There are so many companies that aren’t trying to change to meet their customer’s needs. Network for Good is responsive and takes our feedback to heart. I feel valued as a customer. I’m positive that we’re nowhere near your top echelon of income, but you treat us like we are. The price point is great, but the level of service that you all provide is truly impressive. Latoya Lewis: As a new nonprofit, having a personal fundraising coach was crucial for me to make sure I was doing what I was supposed to and maximizing the software. I’m able to track donor engagement and see who’s opening emails, I can track how often someone donates, who’s lapsed, and how campaigns are performing. Looking at every dollar I’m going to spend, any decision has to be a smart investment. Cashflow is always a concern in the beginning stages of every business. Without Network for Good’s understanding of our budget, we could have never benefited from this amazing service. I wanted to keep track of who our donors were and what they were doing. And I knew I wanted to have that information in one place. Our time is limited, especially in my role. I wanted ease of access, an easy learning curve, and the ability to share information and reports with other members of my team. That was essential. Network for Good is open to our experience as a small nonprofit and growing the product based on our feedback and comments. I feel like I have a role in the product. That’s not the usual kind of treatment when you’re working with a software company. It’s more than just a client relationship. We feel like part of the team. It was a pleasure to learn more about these three amazing nonprofits and hear firsthand about their mission and the communities they serve. We’d love to work with your nonprofit, too. Click here to find out what we can do for you today.